Really Reasonable Ribbon Blog: Happy St. Patrick's Day! All of us here at Really Reasonable Ribbon would like to say Happy St. Patrick's Day to each of you! I hope you have your green on today. :) If not, grab a smidgen of green ribbon you picked up in the RRR store, pin it to your lapel, and you'll be good to go! To get you in the mood for festivities later in the day, I'm sharing with you an altered project I made for one of my sons. He saw it while it was a 'work in progress' in my craft room, so he actually thinks it was made for his brother. What a sneaky mom I can be when I need to be! Grins! I started with a wooden shamrock wall hanging I found on the JoAnn's website. I did quite a bit of work on it to get it ready to alter. 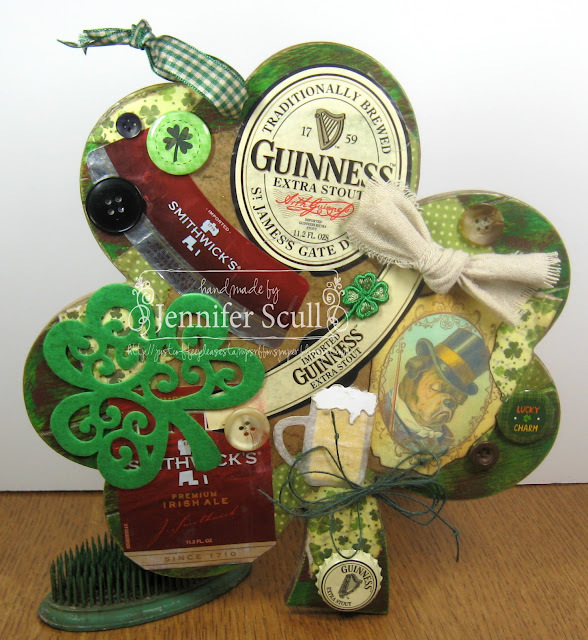 (More detailed information can be found on my blog so I don't bore you with it here....) Irish beer labels, felt shapes, vintage applique, and flair buttons are just a few of the things I added to the collage. Plain cotton blend ribbon was tied and added to the shamrock face, green burlap string was tied in a bow around the stem, and 5/8" emerald green gingham plaid ribbon is used for the hanger. I did add some kraft ink to the gingham to age it a bit. Thank you so much for stopping by today! have fun celebrating! Stop back and play along with our new Challenge which will be up and running tomorrow. I like this wooden shamrock you made. Guinness!! Happy st. Patrick's day to you to.